PayPal is an all-in-one online payment solution that is both a merchant account and payment gateway. PayPal offers two types of Payment Gateway setup, i.e. PayPal Pro and PayPal Express. Type the API Username, API Password & API Signature in the corresponding fields that you received from the service provider. PayPal Pro supports all credit/debit cards except Interac Debit cards. PayPal Pro account holders can make the payment directly by using their account credentials. PayPal Pro also accepts instant payment for which no additional settings required. For recurring payment, PayPal 3.0with DPRP (Direct Payment Recurring Payment) must be enabled. Website Payments for PayPal Pro for all countries is also enabled. Please call to PayPal Pro to enable DPRP for your account and we support only PayPal Pro 3.0with DPRP enabled to setup the payment gateway. Currently PayPal Pro is only available to US, UK, and Canadian merchants. PayPal supports payment methods including, Subscription, Subscription Bundle and onetime payment methods including PPV, PPV Bundle and Pre-Order. It supports support Muvi Kart. It supports multi-currency including US Dollar, Euro and GBP. PayPal Express doesn’t support credit card payment. Your end-users can make payment only via PayPal. They will be redirected to PayPal’s website to make payment. PayPal Pro lets the user to enter his/her account information directly from your form or on your website. The user will never have to leave your website. There's also more customization options to your form and the transactions on your website. PayPal Express checkout lets your subscribers to complete the transactions in less steps. It allows them use billing information stored securely at PayPal to check out, so they don't have to re-enter it on your site. By creating a PayPal Sandbox account, you can test the transaction in your store. You can test the transaction from a user’s end and view all the transactions as a seller in your PayPal account. First, you need to create two Sandbox accounts (a Buyer Sandbox account & a Seller Sandbox account) on PayPal Developer Portal to test the transaction in your store in the Test environment. After creating the Sandbox accounts, you need to send us the API credentials. 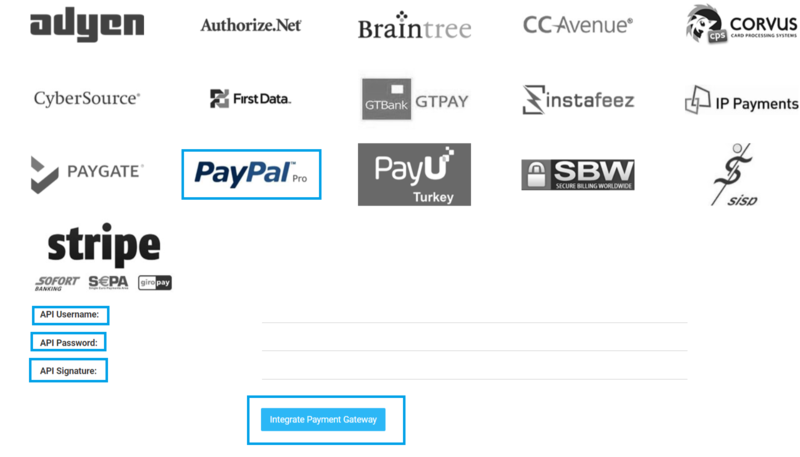 We will configure the test payment gateway for you. Then you can test the payment gateway. For more information please Click Here.